Rabbi Yudi Steiner worked with students to raise money for a Kosher food truck in D.C. Updated: May 17, 2016 at 6:41 p.m. Starting this summer, you can enjoy healthy kosher food closer to campus. The Jewish Colonials Chabad has raised over $65,000 to start a kosher food truck, called the Brooklyn Sandwich Co., that will serve New York deli style cuisine. Rising sophomore Carly Meisel, who spearheaded the effort, said the food truck will cater Jewish events and will be parked at various locations around D.C., including on campus. The truck will cater its first event, a celebration of Lag B’Omer, on May 26 and start operating around the city before July 1, Meisel said. A GW alumnus provided the majority of the $65,000 for the truck, but Meisel started an online campaign to raise the additional $15,000, she said. Meisel turned to Max Friedman, Liran Cohen and Ari Krasner, three students who are involved with Chabad and started Givebutter – a fundraising site similar to GoFundMe. On the Givebutter website, people donating can add a GIF when they post their donation, which then shows up on the website’s homepage. In just 32 hours, 208 donors contributed more than $16,000 to the campaign, which Meisel said was encouraging. “The bottom line is we needed this money to raise, and we decided to do it in a crowdsourcing way to first of all make sure people were aware of what’s happening here and get people excited about it and then to make it a community effort, to bring students together, make it our truck together,” Meisel said. Meisel, who keeps kosher, said she was frustrated by the lack of fresh kosher food available around campus, especially since 30 percent of GW’s undergraduate student population is Jewish. “In general, I think that students having kosher food and enjoying it and having it be appealing to them and having it appear often at school is super important,” Meisel said. Meisel, who is majoring in Middle East studies, said that she considered pushing to add options to J Street or even opening a brick and mortar store to solve the issue of a lack of Kosher food on campus, before she found inspiration from recent college graduates who started a kosher food truck in Boston last year. Having access to a food truck will allow students who keep kosher to bring back the social aspect of eating meals, she said. 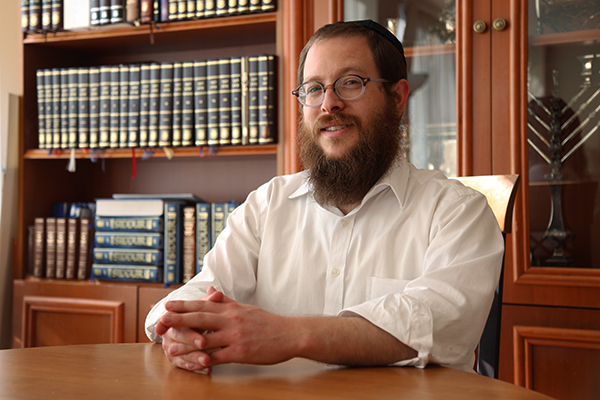 Meisel worked with Rabbi Yudi Steiner, a leader of Chabad at GW, to help coordinate the project. Steiner helped her find funding for the truck and connected her to culinary and food truck experts. Steiner said Meisel spent hours researching every kosher chef on the Internet, but Sam Axelrod – who Steiner described as a “Brooklyn foodie” – ended up creating the menu. Steiner said they focused on making sure the menu was healthy – swapping french fries for crispy potato wedges and mashed potatoes for cauliflower mash. Other items on the menu include matzo ball soup, pulled brisket on a pretzel bun and vegetarian chili. Steiner and Meisel also hired Dylan Kough, a D.C. food truck consultant who runs his own food truck Smoking Kow BBQ, to guide them in the process. Steiner added that the food truck will operate later at night because of student complaints that there is no place to buy kosher food past a certain time. Students will be paid to work in the trucks, helping to prepare the food and working as cashiers, Steiner said. While the truck will run the “regular food truck circuit” at Farragut Square and L’Enfant Plaza, it will be on campus a “number of times a week,” he said.